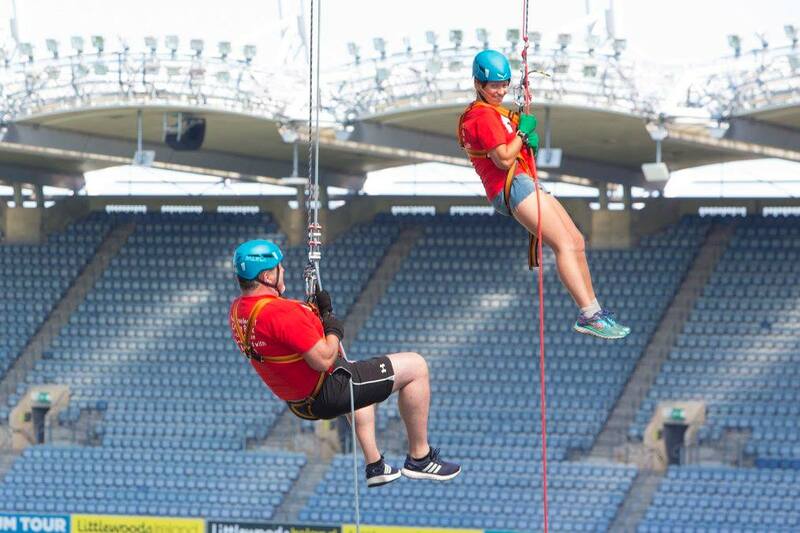 Autism Assistance Dogs Ireland (AADI) are extremely grateful to all the amazing abseilers who took part on 'Abseil for Autism' at Croke Park on June 9 and raised an inspiring €33,000 to help change the world of children with autism on the charity waiting list. Debbie Carr, who received an Autism Assistance dog for her son Aidan last year, explains "Nothing was keeping me away from doing this abseil. Before Aidan received his autism assistance dog Gandi from AADI, Aidan could hardly leave the house because of his chronic anxiety and sensory overload, symptoms of autism that are so difficult to cope with. Last year, I wouldn't have been able to leave Aidan to do this abseil. Before Gandi, Aidan was on sleeping tablets for 14 years, anti-psychotic medication, all to help him cope with the distress of sensory overload. We could go nowhere, not even to the local shop. Fast forward a year on from getting Gandi, and Aidan has a new life. It is like a miracle. Gandi takes away all the once crippling symptoms that autism threw at him. I am so touched by the generosity of everyone who took on the 'Abseil for Autism' Challenge. Everyone there wanted to make life better for children with autism. I think seeing my son Aidan, and learning just how much AADI has changed not just Aidan's life, but the lives of all our family, because of the incredible training that they have invested in Gandi, has blown everyone away. I urge the public and businesses to get behind AADI and help them to get more autism assistance dogs for the children with autism who are going throw hell. Gandi has been our life line and I want to see more families affected by autism supported to get the lives that they deserve with these amazing dogs. Without AADI I don’t know where we would be today". Autism Assistance Dogs Ireland CEO, Nuala Geraghty confirms “Although we know that our dogs, which are trained over two years, are changing the world for children with autism, we have had to close our waiting list because of lack of funding and a lack of understanding as to the critical support that these dogs give to the child with autism and their family. We have over 200 children with autism on our waiting list and have had over 1,000 enquiries from families in distress, pleading for one of our autism assistance dogs in the last 5 months. The amazing support that all the abseilers showed at Croke Park and the work they did to raise €33,000 to get more children off our waiting list is truly remarkable. We have booked our ‘Abseil for Autism’ for 2019 already and have scheduled a second date, such was the eagerness of our supporters. It really was an incredible day, but the most incredible part will be ringing families to tell them that their nightmares are nearly over, that we have an autism assistance dog ready to help them. That’s what matters." It costs 2 years and €15,000 to train AADI Dogs to Assistance Dogs International Standards. The charity receive no government funding and are reliant on the support of individuals and companies across Ireland. Most importantly, all of the charity's assistance dogs are provided to families completely free of charge and are only placed with the family when the dog is fully qualified to make a life lasting impact. If you would like to donate to change the world of a child with autism, visit Autism Assistance Dogs Ireland at www.aadi.ie to make this difference.